It's Black Friday and Cyber Monday weekend! We've seen some of the world’s biggest retailers slashing their prices in the run up to Christmas – and that means there are loads of bargains to be had. Finding the best deals for musicians isn't exactly easy – offers are updated daily (sometimes hourly) scattered across many different retailers, and of all different types: from deals on ukuleles and cheap acoustic guitars to drums and keyboards. Beginners are particularly well-served by Cyber Monday bargains, so if you want Christmas gift ideas for a family member who's always fancied learning the guitar or ukulele, this is a great time to look. We've scoured the web for some of the best offers and posted them below, so check out the best bargains on musical instruments! 15% off Fender at Sam Ash! 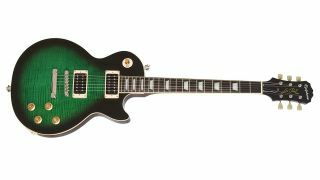 One of the most highly sought-after incarnations of one of the most highly sought-after guitars: the legendary Gibson Les Paul. With a choice of Heritage Cherry Sunburst, Honey Burst, or Tobacco Sunburst Perimeter gloss nitro lacquer finishes, the AA-grade figured maple top is married to a solid, non-weight-relieved mahogany back to give this Les Paul the classic tone and look of some of the most iconic Les Paul models ever made. Sheer class. Another starter pack, this electric guitar superkit comes complete with electric guitar, 20 watt practice amp, spare strings, tuner, strap, carry case, picks and connector cable. Clocking in with 4.1 out of 5 stars on Amazon's user reviews, it's a steal for the price.